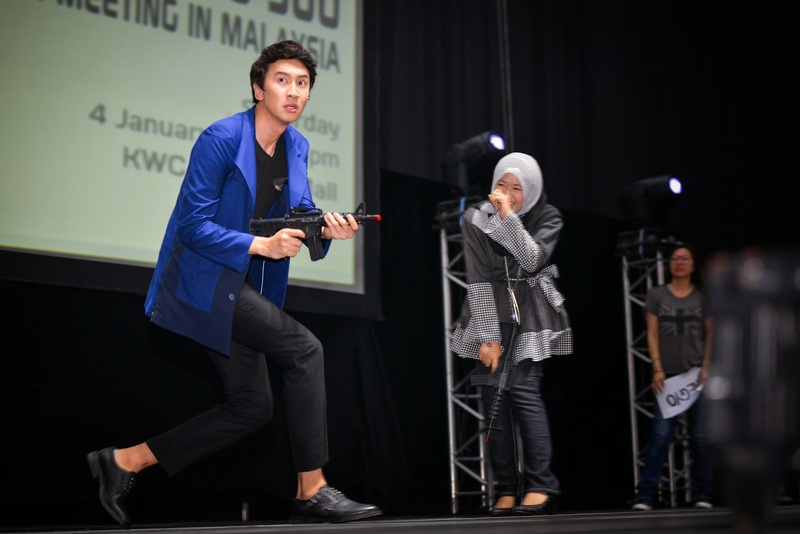 The long awaited Lee Kwang Soo fan meeting in Malaysia kicked of on 4th January 2014 at Kenanga Wholesale City. Baki Zainal acted as emcee for the fan meeting. Also, before Kwang Soo came out, there were an introduction video which made everybody pumped up. He came out singing Hug by DBSK which made the fans go wild as they lay their eyes on him. Baki then asked him a couple of questions such as What type of Malaysian food have you tried and Kwang Soo said Roti Canai. He jokingly spread his legs because Baki is shorter. The first game started off with randomly picking 4 lucky fans. Random envelopes with a word such as Tough, Romantic, Aegyo and Fashionist that each participant picks. Kwang Soo would have to act each one out and the participant with the word have to imitate him. It was really entertaining how Kwang Soo made those actions his special way creating laughter of fun among the crowd. At the end of the game, all were chosen winners and got to take a photo with Kwang Soo himself. After that, Kwang Soo went backstage and changed to white. He started playing the keyboard as the light shines down singing "사랑하기 때문에". Then proceeded to the second game of the evening with 10 fans selected at random. This game is rather complicated with 5 specific movements Kwang Soo portrayed, the 10 selected fans will have to select only 1 movement he portrayed in each round randomly. The winner will have to match with his movement till the end of the game. The winner turns out to be a lucky small boy which got a special autograph from Kwang Soo, a hug and flowers too. Following up is the 3rd game, everybody in the crowd participated in this. With questions asked about Kwang Soo, everybody will have to answer yes or no using their arms and only 10 remaining fans will be able to get a special edition Lee Kwang Soo t-shirt with his autograph. Various questions from his shoe size, height, blood type, favourite drink, favourite fruit, hobby and etc. The lights that shines down got brighter for the staff to check if anybody is cheating. After that, Kwang Soo shouted “My heart to yours! 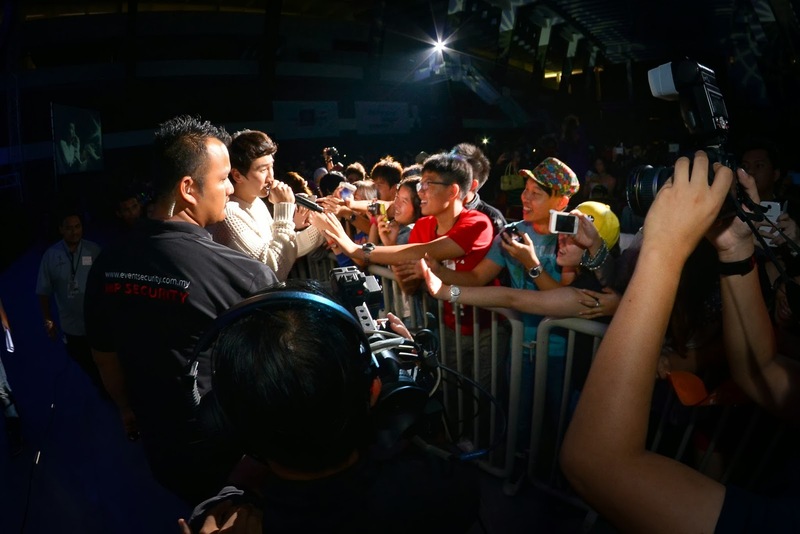 I love you Malaysia!” Loudly and enthusiastic. Later, he sat down with the translator and Baki for an intimated Q and A session in-front of all the fans. How do you feel coming to Malaysia? LKS : I'm thankful but I'm more touched and I will forever remember all my fans here and I love you all! What do you like about being part of Running Man? LKS : I thank Running Man for recognition and its like I've got a new family and they matter a lot to me. What influence do you hope to achieve being called by fans Prince of Asia (아시아 프린스 ) ? LKS : Firstly, thank you so much for calling me Price of Asia, I'll work hard to show you every side of me! LKS : Preferably, someone shorter than me and have a great smile. What made you decided to take up the role of Prince Imhae in Goddess of Fire that's different from your image? LKS : I really want to have a tough image in real like but after the drama ended, I think I failed. What else of character you would want to take up in the future? LKS : Maybe like a Casanova or a womaniser. What challenges you find difficult to face? LKS : So far there aren't because I enjoy doing what I'm doing. Currently what projects your doing and future projects as well? LKS : I'll be busy in 2014 and hopefully you all will see me in upcoming dramas. Also, I'll tell the Running Man members that Malaysia fans are awesome! Afterwards, a special video dedication to Kwang Soo made by the fans in Malaysia was shown on the huge screen. The video made Kwang Soo eyes watery and was really touched. 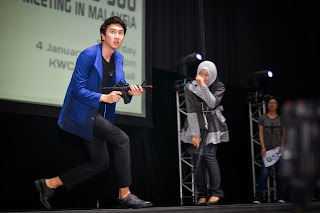 Following was the Lee Kwang Soo Malaysian Fan Club Admins came up on stage and presented him with gifts. 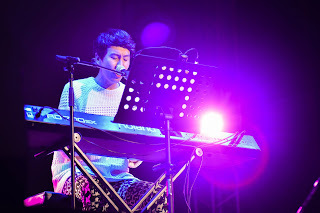 Finishing up the event, Kwang Soo sang a heartfelt song "I Believe", as he sings, he walked towards the crowd and interacted with the fans. After he is done singing, he bowed down and thank the fans one more time. Our publication would also like to thank JS Concert Productions with Faith & D Entertainment and King Kong Entertainment for giving us an opportunity to cover this event.